Rainbow connections are natural combinatorial measures that are used in applications to secure the transfer of classified information between agencies in communication networks. Rainbow Connections of Graphs covers this new and emerging topic in graph theory and brings together a majority of the results that deal with the concept of rainbow connections, first introduced by Chartrand et al. in 2006. The authors begin with an introduction to rainbow connectedness, rainbow coloring, and rainbow connection number. The work is organized into the following categories, computation of the exact values of the rainbow connection numbers for some special graphs, algorithms and complexity analysis, upper bounds in terms of other graph parameters, rainbow connection for dense and sparse graphs, for some graph classes and graph products, rainbow k-connectivity and k-rainbow index, and, rainbow vertex-connection number. 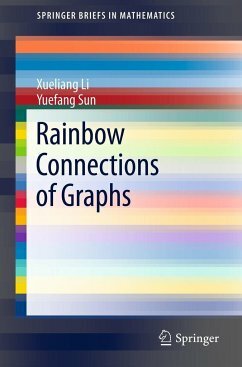 Rainbow Connections of Graphs appeals to researchers and graduate students in the field of graph theory. Conjectures, open problems and questions are given throughout the text with the hope for motivating young graph theorists and graduate students to do further study in this subject. 1. Introduction (Motivation and definitions, Terminology and notations).- 2. (Strong) Rainbow connection number(Basic results, Upper bounds for rainbow connection number, For some graph classes, For dense and sparse graphs, For graph operations, An upper bound for strong rainbow connection number).- 3. Rainbow k-connectivity.- 4. k-rainbow index.- 5. Rainbow vertex-connection number.- 6. Algorithms and computational complexity.- References.